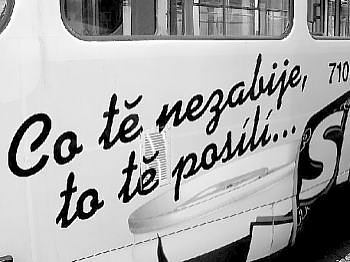 Several Prague trams now sport the following advertisement: "Whatever doesn't kill you, makes you stronger" (it's an ad for a power drink). The "funny" thing is, that this ad is also present on the same tram which killed two people and injured others about 3 months ago. Actualy I think you can be sure, which lines they will appear on, as easily as you can be sure, how long the ads will appear there. Or have you got some insider information i.e. from "Rozum & Chtic" capaign, proving what you stated ? I agree on the fact you cannot be sure with the numbers... But the way, it ended up is the best for the power drink producers, because their ad reached mass-media. Anonymous: Actually I remember from "Rozum + Chtic" campaign that they weren't sure where the banner ends up. The people have spoken. Now what? CNN: "Terror suspects have no right to be funny!" Czech legal system = 0wn3d! Strawberry of death will eat your soul! Declare the war to the fart menace!